"Absolute Temperature Measurement in a Laser-Heated Diamond Anvil Cell," J.F. Lin, et al., Geophys. Res. Lett. 31, L14611 (2004). Nuclear resonant inelastic x-ray scattering (NRIXS) spectroscopy of iron at high temperature and pressure has been used to provide independent confirmation that the Planck radiation function is a reliable indicator of the temperature in the laser heated diamond anvil cell. Using the principle of detailed balance and the peak intensities from the NRIXS data, the absolute temperature of the iron-57 sample at 58 GPa and elevated temperatures was determined. 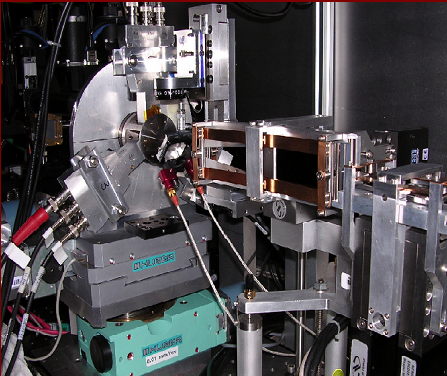 The data show that the Planck function and the temperature as measured by NRIXS are good agreement up to at least 1700 K. Photo: NRIXS apparatus at beamline 3-ID (XOR) of the Advanced Photon Source. To see the relationship between temperatures determined by the Planck function and the detailed balance principle, click here. For more information, download the reprint.